2. My best years as a child were filled with countless Kobe memories. I can’t say that I do remember the Lakers’ three-peat from 2000-02, but I can say that the earliest memories I have of watching sports start with a man named Kobe Bryant. As a little kid, I had no idea what was going on when I would watch a basketball game, but I saw that my dad liked a team called the Los Angeles Lakers. Just as I started playing basketball at 5 years old, I began to understand what was going on in that television in my living room when I watched the team with the purple and gold jerseys. A 5-year-old boy can only fit so much information in his brain, so at the time I could tell you one thing about the Lakers: Kobe Bryant and Shaquille O’Neal were good. I didn’t know what made them good, I just knew that the announcers said their names more than the other players, and my dad talked about them more than any other famous people. I have very little memories of watching O’Neal play for the Lakers, but I know that it was right around the time he got traded that I started to know what it means to be a “fan” of something. Everything was so simple as a child. Happiness came so easily to me, but in very basic ways: Riding bikes, hanging with friends, eating ice cream; you know, pretty much the basic things that bring joy to little kids. But it was when I was around 7 years old that I began to feel an emotional connection to this basketball player, who I would watch in my room until my parents made me go to bed. I also began to understand why my dad would sometimes be happy, and sometimes be sad when watching other people play basketball. Watching Bryant play well brought me a certain joy that I became accustomed to for many years. The first specific “Kobe” moment that I can clearly remember was his 81-point game against the Toronto Raptors on a Sunday night on January 22, 2006. No I did not look that date up, and that’s because that date was one of the most life-changing moments for me as a child. By this time I knew all of the Lakers players, had numerous Bryant jerseys, and had a reputation at school for talking about Bryant way too much. My dad and I watched most Lakers games downstairs, but for some reason on that Sunday night we watched this special game in my room. My dad was laying on the bed watching and I was sitting two feet away from the television absorbing what I was seeing. Shot after shot, I simply couldn’t believe what I was witnessing. I was always big into superheros as a kid, but it was that night when Bryant became my idol; the superhero that I truly believed could do anything in the world. I simply couldn’t get enough of Bryant. Every day after I came home from school, I just couldn’t wait until I could turn on the TV and watch Bryant on Fox Sports West with Joel Meyers and Stu Lantz. Then, I would talk about the game non-stop at school. Kids knew I was a Kobe fan, so they would try to argue me that LeBron James is better, or that Bryant is a ball-hog, and I would never hesitate to unleash on them every Bryant stat I had soaked into my 10-year-old brain. 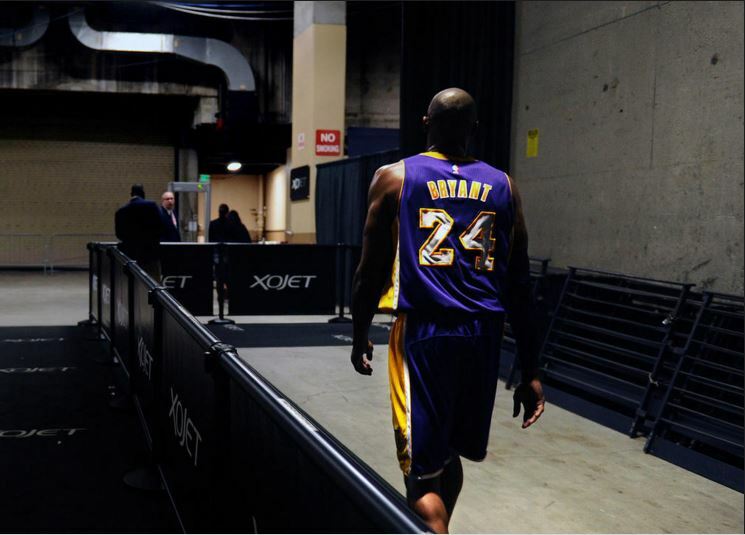 I felt a personal relationship to Bryant, so when somebody would doubt his greatness, I felt like I needed to defend him. Everybody knows that Bryant’s ego can at times get out of control, but when I was a kid, basketball was just too simple to think of those outside factors. I enjoyed watching Bryant play basketball and that was it. This simplicity is what makes being a child so great. Something so basic and routine brought me more joy than the most complex things in the world ever could. People would always ask me, “Why are you so obsessed with Kobe?” or “Do you talk about anything else?” and I knew that people just didn’t understand. I wanted people to know how much I knew about Bryant, and how close I was to him in my mind. It’s like when parents talk about their kids. When a little kid scores a goal in his soccer game, there is a reason why the dad will yell “That’s my boy!” It was 2008, Bryant was truly at his best, and I wanted people to know that he was my favorite player. Every time he had a good game, which was pretty much a nightly occurrence during that year, I wanted to go to school and tell everybody about it like he was my own kid. I’d like to point out that so far this has been all about me as a Kobe fan, not a Lakers fan. Was I a Lakers fan? Yes, a huge one, but without Bryant I don’t know if I would have watched every single game. The reason for this is that in my early childhood the Lakers just weren’t that good. Bryant would go out and score 30, but they would still lose about half of the games. It wasn’t until 2009 when I felt that every game that I had watched paid off. When the Lakers beat the Magic in Game 5 to win the championship, I felt that Kobe and I had finally done it. Sure Bryant really had already done it three times, but I wasn’t there for it. I felt like I was part of the championship because I had been by Bryant’s side the last four years or so. I felt untouchable at school because Bryant had just won a championship and I saw it with my own eyes. It was this sense of accomplishment that fueled my love for him all throughout my childhood. When he succeeded, I felt that I succeeded too. I was now in middle school, and my pride as a Kobe fan had only intensified. Out on the basketball courts during lunch there were arguments daily when I would just take on every “Kobe-hater” on the blacktop, and I would just refuse to back down. At the time, I didn’t understand that my friends were doing it to mess with me and see me get mad. I simply couldn’t comprehend how these people did not see what I saw in him. The passion, the greatness, everything that made me idolize him for so many years. I was now 12 years old, and even though I had grown more mature and thought more logically than I did when I was a 7-year-old boy, I still thought Bryant could do pretty much anything. The first time that I really felt true pain watching Kobe was when the Dallas Mavericks swept the Lakers in the 2011 Western Conference Semifinals. I remember I was forced to attend a breakfast with my family at a local country club, and they had the game on the TV. I could care less about the food or the conversations that were going on at the table. All I could take in at the time was that Jason Terry and Dirk Nowitzki were not going to miss a shot anytime soon. It hit me quickly that this season was over, and I couldn’t handle it. My dad always talked about the three-peat with Shaq, and I knew that Michael Jordan had a few three-peat’s for himself. That was the one thing that I felt that Bryant and I had not gone through together. I wanted to see them win one more. As soon as the game ended I could not stop crying and I just wanted to go home. He did the impossible: he let me down. Looking back at it now, I know that the series was not his fault, but at the time I didn’t know how to respond to his failure. I would say that loss to Dallas had a huge effect on me. After that, I was just never the same. I didn’t spend the time to argue back at the Kobe-haters, and I didn’t go running around school after Bryant would score 30 points. I still watched every game and ran around the house when he hit a game winner, but I started to realize that he wasn’t the most invincible, flawless godsent from the heavens that I thought he was. The 2012-2013 season was an interesting one. The Lakers acquired Steve Nash and Dwight Howard in the off-season, and like most other Lakers fans, I thought Bryant was going to get his sixth ring. It wasn’t long before it became apparent that maybe Bryant’s ring collection was never going to extend to his other hand. For the first time, I felt that everything was going wrong, and like always, the last person I was going to blame was Bryant. Howard was soft, Nash was washed up, Metta World Peace couldn’t hit the broad side of a barn, you know, pretty much all of the common excuses for the disastrous 2012-13 season. I thought Kobe was the only one on that team giving it his all. It started to become just like the early days of being a Kobe fan: I turned on the television to watch the “Kobe” game, not the Lakers game. However, Bryant’s mileage was really starting to show that season. In his 17th season in the league, he was playing heavy minutes and was often relied on to guard the other team’s best player, which was usually a quick point guard that would make him work his tail off on defense. It was sad for me because this was the first time that I saw Bryant starting to slow down. He was still putting up huge numbers, but just didn’t look like his dominant self. Then I had a flashback to the 7-year-old boy who watched the 81-point game in his room against Toronto; Kobe put up a vintage performance that really did made me feel like a little kid again. It was March, and the Lakers were battling for the eighth and final playoff seed in the Western Conference. I was losing more faith each and every game, and it was getting harder and harder to watch my favorite player come up short consistently. The Lakers were playing bad the entire game as the Raptors were starting to pull away in the fourth quarter. Bryant missed a few shots that would’ve been automatic back in 2006, and I remember telling the two friends I was watching the game with, “He just can’t do it anymore.” My dad had been saying that for the past few seasons, but I never believed him. I didn’t want to believe him because I knew that as soon as I gave in the happiness that I attained watching him play would disappear. Then with just under two minutes to play, Bryant hit a three with a defender drenched all over him at the end of the shot clock. Okay, I thought, maybe he’s got a little left in the tank. A minute later, down one point, Bryant caught the ball out a timeout and launched a fadeaway three from the corner. Cash. I started to feel an excitement that I really hadn’t felt since the Lakers won their 16th championship in 2010. Down three points with around eight seconds left, the Lakers had the ball. I knew the ball was going to Bryant, and what I was thinking was, “if this is the Kobe I know, he will put this thing into overtime.” I was a little doubtful as to whether this 34-year-old man was the same player I had grown to love. For the first time in my life, I didn’t think that Bryant was going to come through, and looking back at it now, I should’ve known better. After taking up almost all five seconds to get open, Bryant was finally able to get the ball in his hands. He was more ready for the moment than ever, calmly pump faked to let Amir Johnson fly right by him, then elevated over Alan Anderson and drained another three. I was so lost for words all I could do was scream like I used to when I was a little kid. Once again, he was superman, and at that moment there was nothing that Kobe Bryant could not do. The game went into overtime, and by then I had full confidence that Bryant was going to win this game. Just like in 2006, it was just too simple. We had Bryant, they didn’t. That’s all I cared about watching the end of that game. The next few weeks felt like a time machine sent me back six or seven years. All I talked about was Bryant; all I wanted to do when I got home was watch the game that night, and everybody at school had to hear me go on and on about his heroics. Well, that brief stint of my 8-year-old self in my 14-year-old body was short-lived. On April 12, Bryant’s life, along with mine, would change forever. Watching the game at home with my dad, the Lakers were in a tight game against a young, up and coming Golden State Warriors team. The minutes that Bryant played later in that season were really starting to show. There were many times in that game where Bryant had to stop and check his knee, or stayed on the ground after getting knocked down. It was clear that he was in pain, but with playoffs on the line, there was nothing that could take Kobe out of that game. In the fourth quarter, Bryant had the ball on the left wing with Harrison Barnes giving him little space. Bryant made a move to the basket, and then tore his Achilles trying to get to the basket. I really had no idea what happened because he made it look like he was still able to walk. He sat on the ground for a little, took his time walking to the free throw line, and then knocked down the two free throws. My dad knew as soon as he saw the injury that it was a torn Achilles. I didn’t know much about the injury, besides the fact that it was career ending. The Lakers won the game, but I couldn’t care less. All I wanted to see was Mike Trudell on the Lakers post game show to tell me whether my favorite player, my idol that brought me more happiness growing up than anything else, had just played his last game of basketball. I went upstairs after the game and immediately turned on my TV. By then, I was almost positive that his Achilles was torn as I usually believe pretty much anything my dad says. TimeWarner Cable Sportsnet showed the locker room interview with Bryant after the game. It was something that still gives me goosebumps to think about. He has always seemed like the strongest and bravest person on the planet in my mind, and here I was watching superman with tears in his eyes. To me, it was like he was on his death bed. He looked so weak and hopeless, and I felt the same way. My mood growing up often reflected his, and how he is doing, so seeing him in so much pain made me sick to my stomach. Bryant claimed he was going to go through rehab, and was going to return, but my dad made it clear that he was not going to be the same player. I never doubted Bryant, but I also never failed to believe my dad’s words. My 7-year-old self probably would have believed that he was going to come back, and win three more championships and average 28 points per game, but I was 14, and I just couldn’t convince myself that things were going to be okay. I was never going to watch him again and get that feeling that makes me run around the house and scream. I was never going to get another chance to go to school and annoy my classmates about what my favorite player did the night before. It’s now April of my senior year, and graduation is just around the corner. Soon I’ll be starting a new chapter of my life, and there will be one missing piece to that chapter, my hero Kobe Bryant. It’s actually ironic because many people could argue that a student’s high school graduation is the end of his or her childhood. Well, about six weeks before my graduation, Bryant will play the final game of his career. It couldn’t all fall into place any better. My childhood began with Kobe Bryant’s rise to superstardom, and in just few months will end just around the same time as Bryant’s basketball career. Though this may just be a coincidence to others, I see it as God’s plan. Kobe and I, ending this chapter of our lives and moving onto something new. Many students at my school will cry at graduation because they will realize that their childhood has come to an end. I however, will be sitting there on that stage, six-weeks into my adult life, because 48-days ago, I had watched Kobe Bryant’s final game in my bedroom on April 13 at 7:30 PM. That’s where my childhood came to an end.